"When mobsters slew his family, Frank Castle vowed to spend the rest of his life avenging them. Trained as a soldier and equipped with a state-of-the-art arsenal, he now wages a one-man war on crime! Stan Lee presents... The Punisher!" Ahem. 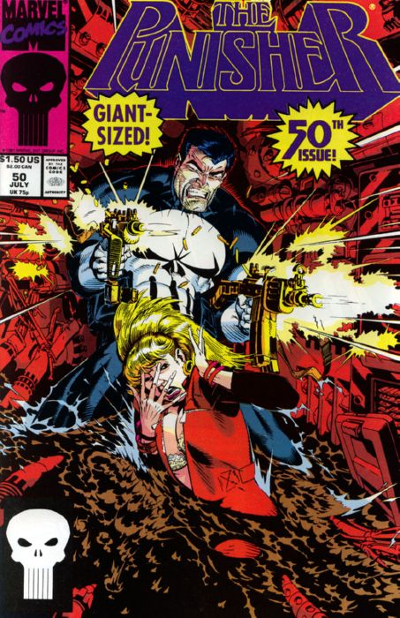 The Punisher 50# is a very James Bond inspired special double sized issue of the Marvel weekly and was written by Mike Baron with art by Hugh Haynes and Jimmy Palmiotti. The Punisher first appeared as a villain in a 1974 issue of Spider-Man and quickly became a cult character. He proved to be so popular that he eventually got his own series of comics and became a hero (or anti-hero) himself rather than a villain. "The Punisher" is Vietnam special forces veteran Frank Castle. When his family was killed after getting caught up in the middle of a mob shoot out in Central Park, Castle decided to devote the rest of his life to fighting crime and terminating the type of people who had killed his wife and son. He wears a (wonderful) black costume with a white deaths head skull logo and has a top secret base of operations where a man named "Microchip" makes all of his weapons and gadgets. Microchip is David Linus Lieberman - a former genius computer hacker. When Lieberman got too close to the secret files of a crime organisation they killed his nephew in revenge and so - like Castle - he now devotes his life to fighting mobsters and criminals and eventually teamed up with The Punisher. He's sort of like Q from the Bond films I suppose. As The Punisher is a vigilante, Castle and Microchip are off the grid so to speak and always in hiding. The police would arrest The Punisher if they ever caught him. The Punisher is like a cross between Batman (like Batman he uses fear and intimidation) and Dirty Harry. Unlike Batman though, he doesn't catch murderers and mobsters and hand them over to the police. He prefers to shoot them instead and has a zero tolerance attitude to crime. This makes him a somewhat more controversial character in the Marvel universe (although the all ages nature of these comics means they can never go too far with this) and also more interesting in a way. Some people think that The Punisher is a one dimensional gun toting character who doesn't really fit in with the spirit of Marvel and others find him quite refreshing in a way. He's someone who relies on his training and wits rather than superpowers and his moral compass has been known to spin. Marvel heroes like Daredevil and Spider-Man loathe The Punisher for his methods and he's had his share of run-ins with them. The Punisher is sometimes a comic I can take or leave but I do like the James Bondian nature of some of the more far out stories and this is a good example of those. Punisher 50# is like a James Bond film featuring The Punisher. The story begins here with Frank Castle in church! "Forgive me father for I have sinned. I've been guilty of hatred towards my fellow man... I've killed a few too. Since my last confession between sixty and sixty-five... I'm not sure...." The priest tells Castle he should hand himself in and promises to organise psychiatric care. His sins are too much. Castle tells him they were all bad men though. Murderers, members of underworld societies. It's a nice start to the comic I think. Black humour. Anyway, on the way out, Castle is approached by a woman who mistakes him for a priest and seems a bit dotty and babbling. She gets his attention though when she starts talking about how her son was killed working on a dam project for an "evil" man. Castle looks at some documents her son stole before his death and sees a corrupt bureau of land management and phantom payrolls. That piques his interest. The Grand Couree Dam in Southern Colorado is built on sand and will not hold for long and workers have vanished without trace. Something very crooked and dangerous is going on. The man behind the dam? "Yo Yo Ng". Also a leader in cryogenic research and inventor of the Astrex Biosphere in Colorado - a $100 million greenhouse made of space-age plastic where Yoo and Yo and his chief scientific employees are currently living to see if man can survive in an artificial self-contained environmental system. Yo Yo is clearly a very dubious character indeed and it's time for The Punisher to pay him a personal visit. But first he will have to infiltrate the space-age biosphere. This is all very James Bond and Yo Yo is a decent villain as far as these types of comics go. He's an albino with a shock of white hair and has a razor studded Yo Yo that he uses to kill people! He's also a martial arts expert and if you annoy him you'll end up in his cryogenic lab. NASA think Yo Yo is doing research for them but he's planning to rip them off. He believes his impenetrable biospheres will not be put into space but in American cities when law and order collapses in about ten years. He'll make a fortune if he's correct about the the near future descending into anarchy. The art is very good here too. Some nice splash pages of the dam and some good desert panels. The Punisher's method of getting into the biosphere is very inventive. A downhill underground tunnel that runs for thirty miles. He uses a skateboard to get down there! Despite being a double sized issue, the comic is not terribly long (by graphic novel standards) and so the action comes thick and fast. 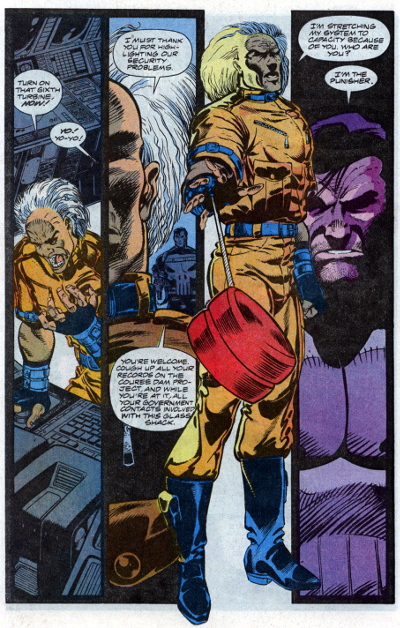 The Punisher has to deal with numerous guards and also has a macabre visit to the cryogenic lab before his final showdown with Yo Yo. One nice touch is that Yo Yo has a tropical garden in the biosphere that is like a miniature jungle so The Punisher is able to deploy his jungle fighting skills and trusty knife. It's a ludicrous comic at the best of times but the throw the kitchen sink at the page for the sake of a good show quality is great fun. It builds to an exciting third act with plenty of grand scale art involving explosions and water. You can see they put more effort than usual into this double sized issue and it's a good story on the whole and worth picking up if you are a Punisher fan. There is a bonus story here too entitled Bark Like a Dog. This is set in Ryker's Island. A prisoner there tells other inmates about an encounter he had with The Punisher and how he got the better of him. But then another prisoner tells everyone the real story. The man is a liar and a coward and The Punisher stopped him from attacking a woman in a park at night. This is nothing special but not a bad bonus addition. Quite clever with some striking art (as the prisoner is telling a tall story The Punisher is illustrated in his dubious flashback like a spectral mythic ghost of the night). The Punisher 50# is a fairly shortish but enjoyable undemanding read and worth picking up if you have a weakness for vintage Marvel comics from yesteryear.